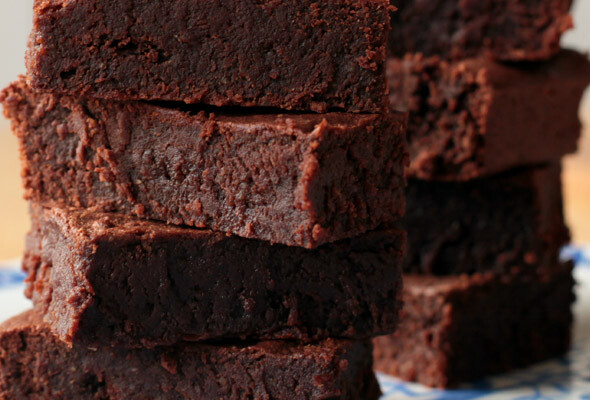 These wheat free brownies – yes, wheat free – are as good as the wheat flour kind. I promise. (Or your money back.) The recipe is very simple and came about as a bit of experimentation with some rye flour, ground almonds, Green & Black’s Maya Gold 55% chocolate and a couple of tablespoons of Nutella. The good thing about these brownies is how dense and chocolatey they are – they also have a hint of orange from the Maya Gold chocolate. If you wanted to use 70% cocoa chocolate I’d recommend adding an ounce or two more of sugar and I’d definitely try a version with large chunks of white chocolate and some toasted hazelnuts next time too. Exhibit A: Chocolate squares of damp chocolatey squidginess. I’m still trying out wheat free baking recipes, one slow step at a time. I did try a batch with wholemeal rye flour, but found the stoneground rye just a little too wholesome (almost like having weetabix in your brownie). I then picked up a bag of light rye flour and tried a completely different recipe for these nutella ones. Last weekend I went on a food and press trip to Exmouth and was very touched by the effort various cafes and restaurants went to just to make sure I didn’t have to eat any wheat. I hate to make a fuss about this kind of thing and could quite easily have got very upset at missing out, but actually found people were absolutely lovely. Olivier Guyard-Mulkerrin chef patron at Les Saveurs baked his first ever batch of wheat and gluten free pastry for me to have in his signature lemon tart and Kathy at The Chronicle baked a loaf of wheat free bread for my breakfast. What kindness and a sure sign that cafes and restaurants these days are taking wheat and gluten free diets more seriously. A note on rye flour: while containing no wheat, this flour is not gluten free. You will need: A greased tin, 22cm square, 5cm(ish) deep. Pre-heat your oven to 180 degrees centigrade, 350 degrees fahrenheit, Gas mark 4. Melt the chocolate and butter together in a heatproof bowl over a pan of barely-simmering water. Take off the heat once melted and leave to cool slightly. Crack the eggs into a mixing bowl, add the ground almonds, vanilla sugar, pinch of sea salt and Nutella. Mix together thoroughly. Add the slightly cooled chocolate and butter mixture. Sift the rye flour into the bowl and fold in gently (this would also be the point when you would add your chunks of white chocolate and toasted nuts, if using). Dollop into the tin and bake for 20 minutes. The edges should be lightly puffed and the middle should still look damp. Do be careful not to overbake. If the whole thing puffs you would lose that lovely damp squidginess in the pictures. 20 Jun	This entry was published on June 20, 2013 at 1:00 pm. It’s filed under Perfect with tea, Recipes and tagged brownies, chocolate, Nutella, rye, rye flour, wheat free, wheat free brownie, wheat free cake. Bookmark the permalink. Follow any comments here with the RSS feed for this post. These look and sound amazing! Of course, anything with Nutella has got to be great, but I also love that it doesn’t have wheat flour in it. Thanks Jenny! I’m just starting to bake wheat free – will have to check out your blog for some healthy recipes too. Hi! This recipe looks really tasty, and I will have to try it out. Thank you for sharing it! One caution I’d like to share for your readers – some brands of light rye flour have wheat gluten added to it, which would defeat the purpose of making a wheat-free dessert. I checked a well-known North American brand of light rye flour, and it has wheat gluten in it, so it’s possible that other brands do also. Please note that I’m not saying they all do – just that labels should be read anytime you buy. Would regular gluten free flour work instead of the rye flour? Or would that ruin the end result? Looks so yummy!